This is a fantastic Dyrosaurus skull and partial skeleton. This amazing fossil crocodile was found in the Northern Sahara Desert in Africa. 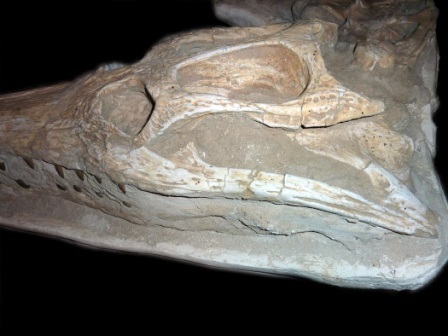 The upper skull is very complete with only a few repairs. The lower jaws are much less complete but still add to the display. It has a number of vertebrae and is displayed in a very well-done field jacket of plaster to be displayed right away as it is. This is a great piece with a skull over 3 feet long and will make an incredible addition to any collection.